Ready for some positive change in your life? Creating clear and focused affirmations can help you bring about that change. In this workshop you will learn how to craft powerful & effective affirmations. 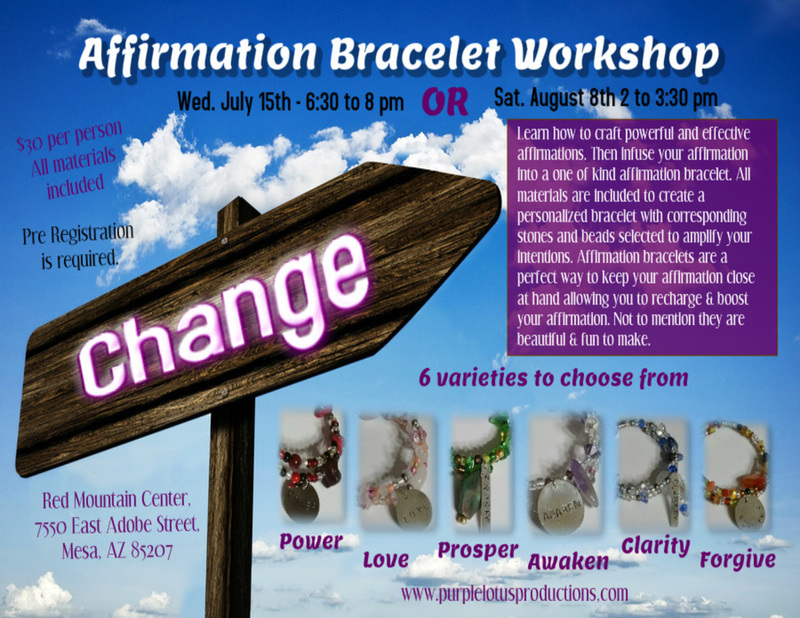 Then infuse your affirmation into a one of kind affirmation bracelet, that you CREATE. All materials are included to create a personalized bracelet with corresponding stones and beads selected to amplify your intentions. Affirmation bracelets are a perfect way to keep your affirmation close at hand, allowing you to recharge & boost your affirmation. Plus they are beautiful and fun to make. 6 varieties to choose from : Power, Love, Prosper, Awake, Clarity, and Forgive. Come join us at the Red Mountain Center - 7550 E Adobe St Mesa, AZ Two dates to choose from either Thursday July 15th from 6 to 8:30 pm of Saturday August 8th from 2 to 3:30 pm. Pre Registration is required and all materials are included in the Workshop fee.